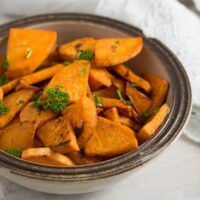 Simple pan fried sweet potatoes, a vegan sweet potato side dish recipe to accompany almost any dinner you can think of. I fell in love with sweet potatoes a long time ago. 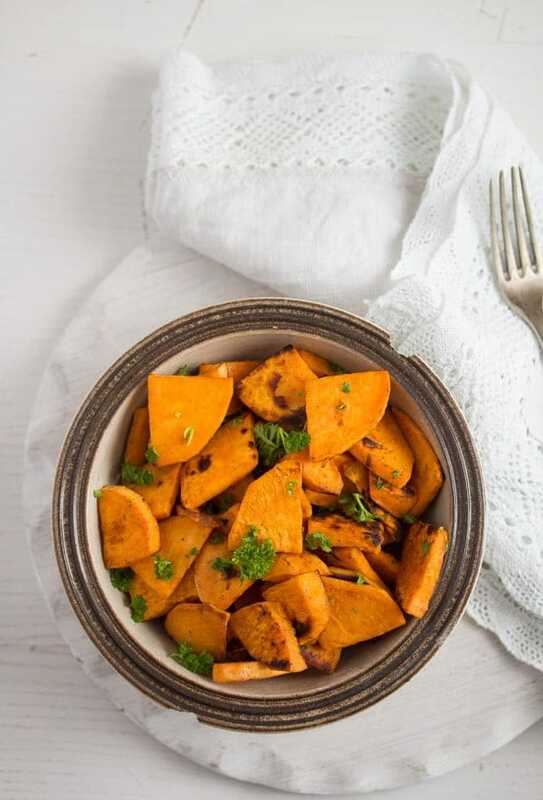 I have never even heard of sweet potatoes during my childhood and teens in Romania, I first discovered and tried sweet potatoes during the time I was living in England. 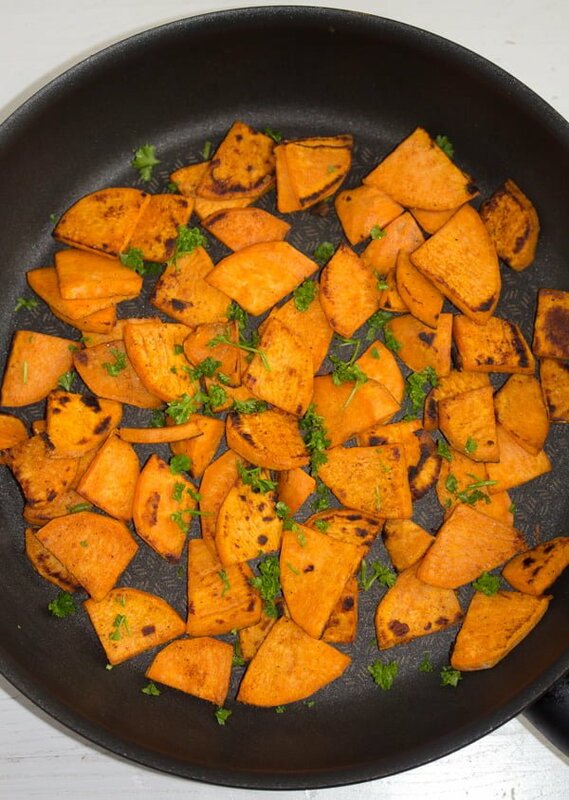 And these pan fried sweet potatoes are the first sweet potato recipe I have ever tried. I wanted something simple that would let me taste the sweet potatoes in their full glory, so to say, for the first time. I did not know what to except, I imagined them tasting more like regular potatoes, I guess. After that first fried sweet potato recipe I did not look back. I kept buying sweet potatoes, I think I have them in the house most of the times. The only disappointment with sweet potatoes until now is that my children don’t like them at all, well, unless they are in a soup… a creamy, pureed kind of soup where they cannot really recognize the ingredients. 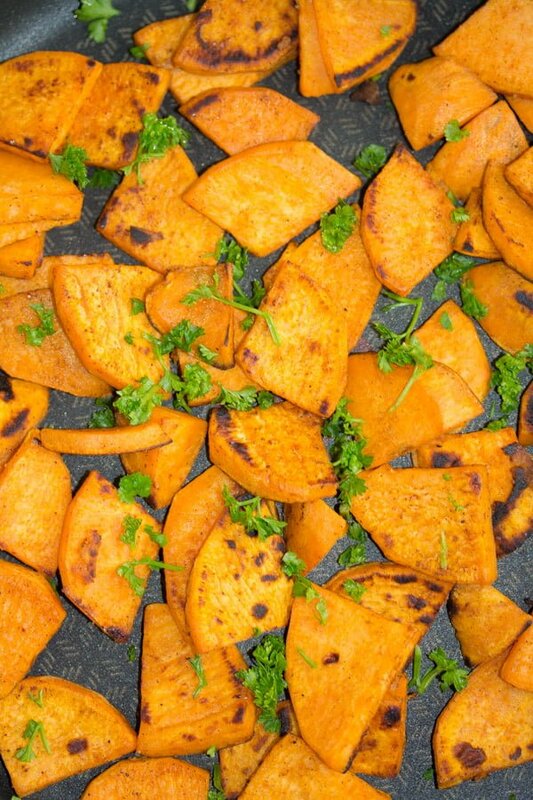 This fried sweet potato recipe is very basic. Just the sweet potatoes, a large skillet or non-stick pan, some oil and some spices. I usually take olive oil or canola oil to fry the potatoes. The first time I made the skillet sweet potatoes, I only spiced them with salt and pepper. So, if that is all you have, don’t worry about it, the pan fried sweet potatoes will still be absolutely delicious. However, spices help to make things even more interesting. 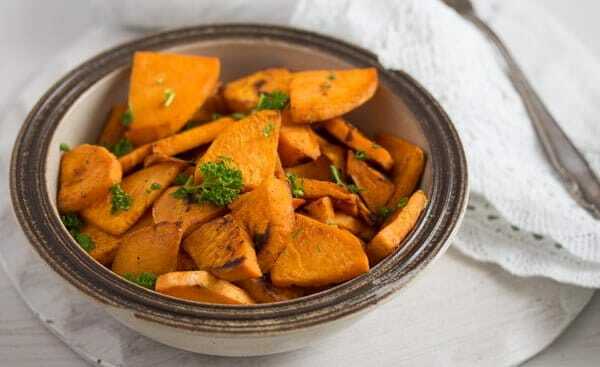 The following are just suggestions for seasoning pan fried sweet potatoes (or oven roasted sweet potatoes), use whatever you happen to have and like. You can always add a sprinkle of brown sugar to the sweet potatoes, I don’t normally do it, but when I do, it tastes nice. Ground cinnamon is not the kind of spice I would have thought of using by myself, I rarely use cinnamon in savory dishes and when I use it, is more for Moroccan recipes. However, I read somewhere that sweet potatoes and cinnamon go well together and I was amazed at how much I loved the combination, I swear I did not expect it!!! You should definitely try it! 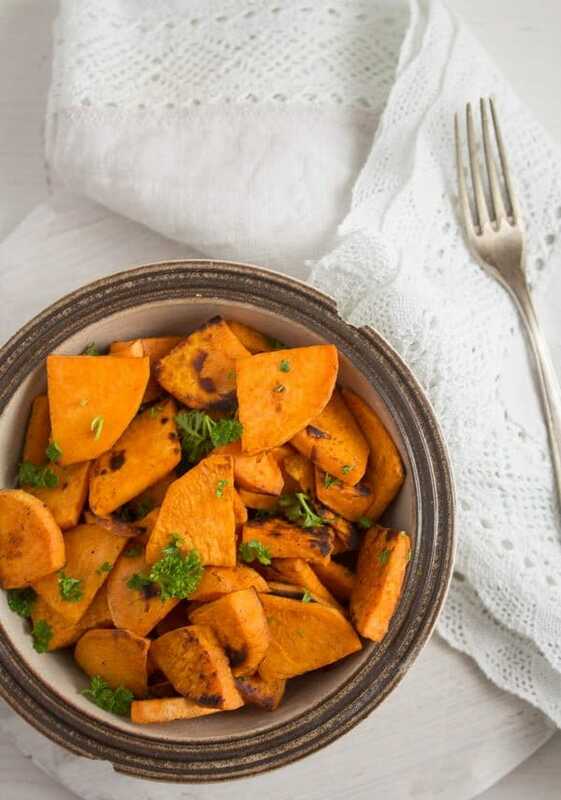 You can sprinkle the skillet sweet potatoes with fresh parsley or fresh coriander, more chili flakes, thinly sliced spring onions/scallions, roasted sesame seeds or nigella seeds. 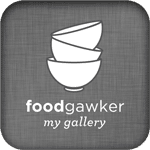 Za’atar or sumac would also make an interesting and delicious change. Making skillet sweet potatoes is super easy. , about 30 cm/ 12 inches diameter. Preferably, use a thick bottomed pan, when I make the sweet potatoes in a thick bottomed pan they remain golden, when using a thinner bottomed pan, they are getting browner. Both ways are delicious, but I prefer the golden potatoes, they look nicer. 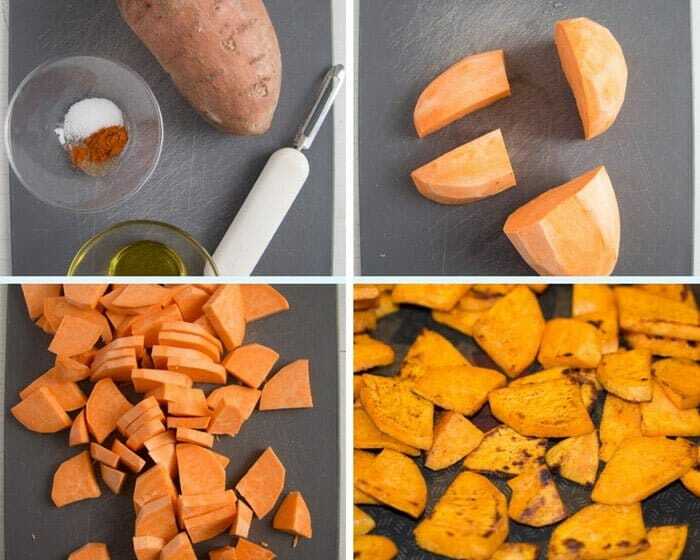 Make sure that the sweet potato slices fit in the pan in a single layer. This way they will get nice and crispy on the outside. If the pan is overcrowded, they will rather stew instead of being fried. This fried sweet potato recipe serves two people. If you want to make a larger batch of pan fried sweet potatoes use two pans. Step 1: Quarter the sweet potato. Cut the quarters into slices, about 4 – 5 mm/ 0.15 – 0.19 inches. Add the spices and stir well to coat. Step 2: Heat the oil in a large non-stick pan or cast iron skillet. Add the sweet potato slices in a single layer. Step 3: Pan fry the sweet potatoes, turning them regularly, for about 15 minutes, depending on how thick they are. Start checking after about 12 minutes, the sweet potato slices should be golden brown, crispy on the outside and really soft on the inside. Step 4: Sprinkle with fresh herbs/sesame seeds/ nigella seeds etc and serve immediately. First of all I would like to say that even if these pan fried sweet potatoes are intended to be side dish, they would still make a wonderful main meal for one. In this case all you need is a salad, like a green salad with yogurt dressing, vegetable salad etc. If you have any leftovers, they are good for filling pita bread with some yogurt or tzatziki, chutneys or hot sauces and cheese. Quarter the sweet potato. Cut the quarters into slices, about 4 - 5 mm/ 0.15 - 0.19 inches. Add the spices and stir well to coat. Heat the oil in a large non-stick pan or cast iron skillet. Add the sweet potato slices in a single layer. Fry the sweet potatoes over medium heat, turning them every few minutes, for about 15 minutes, depending on how thick they are. Start checking after about 12 minutes, the sweet potato slices should be golden brown, crispy on the outside and really soft on the inside. Sprinkle with fresh herbs/sesame seeds/ nigella seeds etc and serve immediately. Note 1: If using cinnamon, add it to taste. Note 2: Read the blog post for more seasoning ideas. Looks like a side dish for growups :-)) I am not surprised that your kids don’t enjoy them. As a kid I didn’t really like them, but now I LOVE them. Sweet potatoes are always a favorite in our house. This is a delicious and simple side dish that’s perfect for everyday dinners.